← INBOX: Kevin Love, Wolves, Parting Ways? + Sam Mitchell! Before we bring Joerger into the discussion, let’s get one thing out of the way first: A quick discussion of what a few of the possibly-realistic Wolves rebuilding strategies might look like. Andy G: In the spirit of this post’s title (and headlining Photoshop!) the first question that Timberwolves Brass needs to ask itself is what its short and long-term vision is; how good — or perhaps — how *bad* are they willing to be in the immediate phase that follows a Kevin Love trade. NBA teams and fanbases view this question differently, depending on a variety factors that includes but is not limited to: recent success or failures; ownership personalities and goals; market size; potential success in the free agent market; current roster makeup; and overall intelligence. The Minnesota Timberwolves enter this rebuilding scenario in a unique set of circumstances. They have missed the playoffs in each of the past 10 seasons. From 2008 through 2010 they put together one of the worst three-year stretches in league history. (It might be *the* worst. I didn’t check.) So the fans are not at all interested in a full “bottom out” strategy that would require watching a steady supply of double-digit losses, quick coaching turnover, and on-the-job training of 19-year old rookies handed outsized offensive roles. Going FULL REBUILD would risk losing the fanbase that remains in Kevin Garnett’s wake. But they also have to consider that Minneapolis and this organization are not going to attract *superstar* talent via free agency. The NBA Draft Lottery is the only available route to replacing Kevin Love with a player or two that can anchor a title contender. So getting a little bit worse, in the short term, could provide long-term benefits. As long as they don’t waste the draft pick(s) on bad player(s). Hold your Timberwolves jokes. Trading Love almost inevitably means getting worse before (hopefully) getting better. How much worse is too much? Patrick J: How bad do you wanna be, if you’re the Wolves, entering a post-Kevin Love era? From a purely rational perspective, you know you’re probably going to get immediately worse without Kevin Love. But you might be able just to get a little worse, if you fill existing gaps with (better) role players, some of whom would be veterans. However, you also have the option of going young, dealing mostly for draft stock and young, but unproven, talent, which may or may not pan out. And if it would pan out, it would likely have a higher return on investment (and at a lower short-term cost) than the “play it safe” angle. It seems like if you’re the Wolves, your choice basically boils down to two things: (1) Can you be a fun/likeable (but bad) team in the beginning, while you know you’re going to be much worse than you were previously? This is necessary to keep attendance and other interest in the team at tolerable levels; and (2) Assuming that attendance will not drop severely after the initial one-year honeymoon, can you expect that squad to make good-enough strides toward being an acceptably good NBA team in terms of the W/L column to maintain fan interest, while also bringing you closer to League-wide competitiveness? If not, you become mired in Milwaukee and Cleveland territory, where your young, rebuilding, team looks in hindsight like the worst-possible set of choices and investments you could have made with what might’ve been some of your last assets of real value. This is a difficult (or, possibly, easy) set of questions to answer if you are Glen Taylor. It looks like you’re going to hire an established (but still young) NBA coach at a competitive salary. You’ll probably need to lock him in for at least 3-4 years. But if you’re really bad, you might end up firing him, and getting stuck paying his check. You want the team to be great and to take a strategic perspective, but you’re faced with the realities of having to put a team out there that will lose you only an acceptable amount of money each season, such that it doesn’t become an unkeepable liability. Looking at it through those lenses, don’t you want to take the low(er)-risk choice of trading for some established guys like David Lee and Klay Thompson, maybe with Harrison Barnes as part of the deal, as opposed to risking everything on a very uncertain return like the one Cleveland’s assets could bring? (READ: perhaps Tristan Thompson, the #1 overall pick, and Dion Waiters.) Sure, maybe one isn’t really all that excited with the Golden State take, but you probably still win close to 40 games a season for the next 3-4 seasons with a Rubio/Thompson/Barnes/Lee/Pekovic lineup. On the other hand, people’s interest will be fully piqued if you sell Love for the #1 pick and Cleveland’s bits, because you’re basically banking on the #1 being a Kevin-Love-caliber player, maybe two, three, seasons down the road–and thereby becoming giving you a better chance of becoming an upper-level playoff contender, if the player is also more skilled at winning than Love. From that perspective, you have to have a lot of faith that Wiggins, Parker, or Embiid, has the talent and attitude to become a top-5-ish player fairly soon. Because if they don’t, you have basically nothing else to fall back on, and you’re in basketball-owner purgatory until forever. But I’d also prefer the Wiggins deal because it could likely include Anthony Bennett, as well. Rather than write out the reasons why Bennett can become very good despite a terrible rookie season, I’ll just link David Thorpe’s TrueHoop video, which hits the key points. Cleveland might include Bennett in a trade because he disappointed as a rookie, he plays the same position as Love, and the salary for the top overall pick (yes, even on the rookie scale) is larger than you might think. Putting together a young core of Rubio, Wiggins, Bennett and Dieng, with Pekovic and Martin around for shorter-term stability, seems like the best way ahead. But then again, it’s hard to see Cleveland dealing the Number 1 for Love without some serious assurance from his camp that he will re-sign there. Basically, we need some Kyrie-Kevlar Collusion, sponsored by Pepsi. Outside of Golden State and Cleveland, any potential suitors that could provide Minnesota with something to get excited about? Patrick J: Meh. Frankly, no team stands out as the kind of potentially-interesting trade partner that the GSW or Cavs do. Specifically, not the LA Lakers. ESPECIALLY THE LAKERS. They basically have nothing we want. No Gasol. No Swaggy. No real assets there. I know the national media wants to concoct ways that LAL could pull off a deal for Love. Don’t believe it. Unless Love says he won’t sign with anyone but LAL, he’s not going there. And if he did do that, and I’m Glen Taylor, I’d be tempted, out of spite, to let him walk for nothing for doing you like that. So, the one place that *is* somewhat interesting is Chicago. Several years ago, I wanted the Wolves to draft *and keep* Mirotic because he looked like a star in the making. We traded him for nothing as part of David Kahn’s binge-trading sesh to fundraise for Kurt Rambis’ buyout. Now we might have a chance to trade a top-10 player in the League to re-acquire him! Andy G: I don’t hate that Chicago proposal. I actually do kind of hate the Houston possibility. The best potential assets we’d gain are Chandler Parsons and Omer Asik. Parsons is pretty good — maybe comparable to Klay Thompson in many ways. But I just don’t really want him on my favorite team for (un)coolness reasons. Asik just isn’t needed by a team that already has Pekovic and Dieng. Any draft picks that Houston could include would be mediocre. I don’t see it with Houston. Anyway, I’m sure there will be plenty of trade rumors in the coming days. 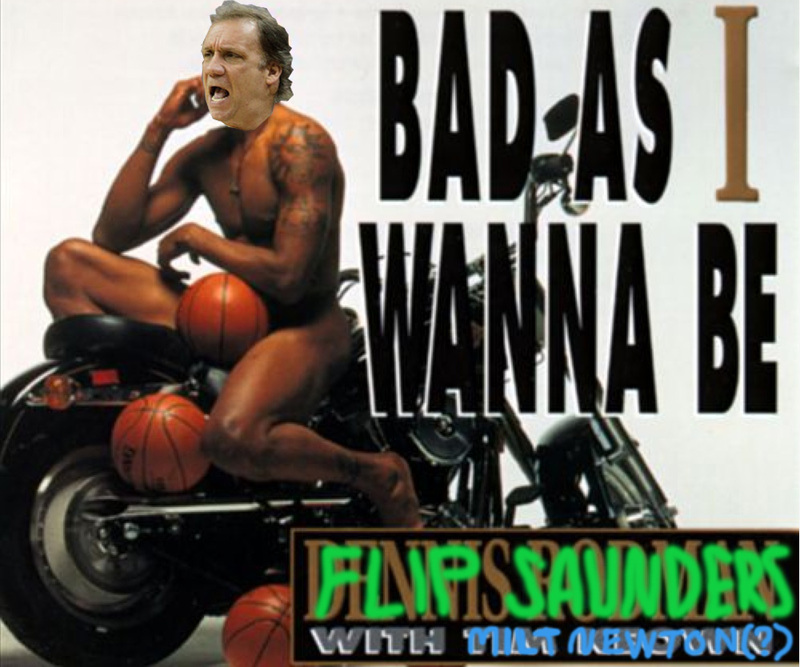 We’ll have to wait and see how bad Flip is willing to be when he ultimately pulls the trigger. In the late sixties, the Knicks had a heralded two-big-guys combo of Willis Reed and Walt Bellamy going. Both were good men, both really talented, both smart, and both, well, big. Their mutual presence alone gave New Yorkers, and Knicks fans everywhere, great hope. Mr. Bellamy, early in his career, had averaged as many as 30 points and 19 rebounds a game for an entire year; by 1968, in combination with Mr. Reed, he was averaging about 19 and 14, respectively. Yet for what seemed an interminably long time, the Knicks couldn’t get over the hump (into any serious championship contention). Nor could they find an effective style of play, a groove, a rhythm. In ’68, Mr. Bellamy was traded for a rather boring, non-descript, non-star persona named Dave DeBusschere, a transaction completed while Mr. Bellamy was still in his prime (four years later, Mr. Bellamy, a heckuva talent, was still averaging 19 points and 14 rebounds per game). Almost simultaneous with this transaction, the Knicks put a new coach in place who not only put great emphasis on hard-nosed, physical, energetic team defense but who (not incidentally) also held some very creative, and ultimately quite effective, ideas as to how to meld the likes of a very special and uniquely talented point guard named Walt Frazier, a struggling Bill Bradley, and the brand new Dave DeBusschere with Mr. Reed and the rest of this jazz—excuse me, Knicks basketball– combo. The faces of all those guys are now on the Knicks’ Mr. Rushmore and suffice it to say Mr. DeBusschere very soon became anything but boring and non-descript. In respect to the Wolves, there’s a DeBusschere out there, he’s obtainable, and it’s up to the Wolves to find him. There’s a very special and uniquely talented point guard already in place—repeat: THERE’S A VERY SPECIAL AND UNIQUELY TALENTED POINT GUARD ALREAY IN PLACE; it’ll be up to the new coach to know how to use him most effectively, much as the Knicks learned how to use Mr. Frazier most effectively. And there are other interesting pieces around for the Wolves—either presently on-roster, or to be had (with perhaps some of these potential pieces “struggling” to this point, having not-yet-found a system and/or coach that “works” for them). And as for the new coach– there’s a Red Holtzman (the Knicks’ gutsy and talented coaching “genius”) out there, too; it’s up to the Wolves to find him, and it’s absolutely possible to find him. Mr. Holtzman was also regarded as rather non-descript, going in. Losing the extremely talented Love doesn’t have to be the end of the world. It can be the beginning; it can even be a very, very fast and exciting beginning. The Knicks began to jell almost overnight—you could see it and feel it, literally– then went on to win 2 championships and to play some of the most exhilarating jazz—excuse me, basketball– ever. The Wolves can do it too. They have the best jazz guy in the league already on the floor, and he craves—absolutely craves– a combo: a combo that plays the jazz, and plays it relentlessly, on both offense and defense, for 48 minutes. Just put the right parts on the floor with him. And a coach with a great jazz collection. Good post–I like your angle and think it might be on-point. Who do you like as that missing piece? I’m partial to Jabari Parker. Andy likes Wiggins. Embiid is a *giant* elephant in the room–he could be the best in this class. And there are others too. Lots of evaluation to be done. Thanks for taking my post. I appreciate your site and all your work that goes into it. I’ll readily defer to you and your colleagues, when it comes to evaluating who the potentially successful missing pieces are. I have a terrible track record. I thought the Boston decision makers were imbeciles for going so hard after Kevin McHale in the draft, instead of the mermerizing Darrell Griffith. I thought the Knicks had blown whatever chances they had of ever successfully rebuilding by going after, and then getting themselves stuck with, Dave DeBusschere. I wondered what the (80s baseball) Cardinals were thinking when they got themselves stuck with this Jack Clark guy (how was he going to fit in with all their jack-rabbits?). Heck, at first listen I wondered what Bruce Springsteen was thinking following up Born To Run with Darkness On the Edge of Town (instead of Born To Run #2). In all 4 cases I was proven wrong, wrong, wrong, WRONG and they were proven right, right, right, RIGHT. I’m older and no wiser. But it does seem (doesn’t it?) that there are people who can be very, very successful at this sort of thing (evaluating, finding, and obtaining the missing pieces), if they’ve been hired and then put in a place where they’re given the freedom (and responsibility) to succeed.